My eating habits as a kid were not like the others children. That should have been my first clue that I was a tad bit strange!!! I often ate bowls of vegetables after school instead of cookies and sandwiches. On those special occasions I got to go to my grandma’s, she would make me other goodies like chipped beef gravy on toast, or lima beans with bacon. Not the typical snack foods for a youngster but tasty and filling! I often looked forward to trips to grandma’s house since my mom didn’t make these at home for me. Don’t worry, mom made a killer carbonara! My favorite dish that Grandma Lois made, not every often because of the time it took, was Rigatoni. Big deal right, everyone has baked pasta. But this dish was different… This pasta dish had a nice twist to it that made it different from the others. Tomatoes that were simmered for an hour to bring out the flavors, and instead of the normal mozzarella cheese used to hold those noodles together, the cheese she used was Swiss. 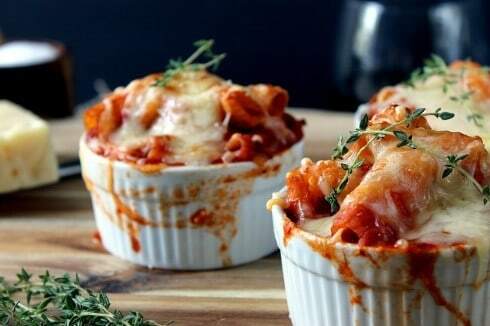 The tanginess of the Swiss cheese and the acidity of the tomatoes lightened this dish and added a new dimension even though it is just pasta baked with cheese! 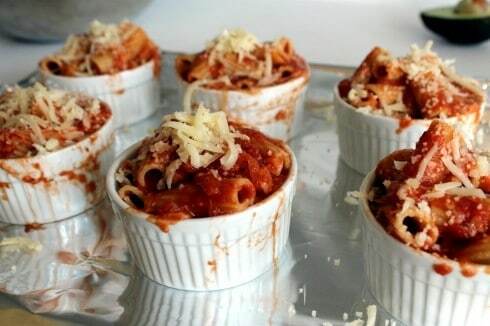 Once the tomatoes are stewed you can assemble these ramekins and then freeze them until ready to use. You can also make this in a large casserole and serve it to the masses! 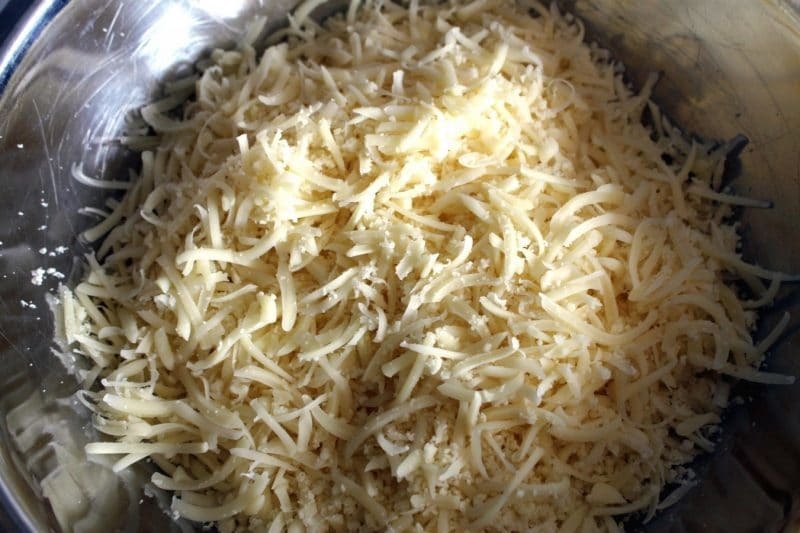 The cheese is best if you shred it yourself as it helps with the melting process since pre-shredded cheese has anti-clumping agents added to it. Anti-clumping powders sound good right?! The fresh thyme and the acidity of the tomatoes blend well with the cheese and round out this warm and gooey pasta dish that is sure to comfort when the nights start getting chilly! This warm and comforting pasta dish has a new twist with Swiss cheese! In a large pot, sweat the onions in the olive oil until clear. Add the thyme, tomatoes, and garlic. Simmer over low heat for 1 hour. Cook noodles while the sauce is simmering. 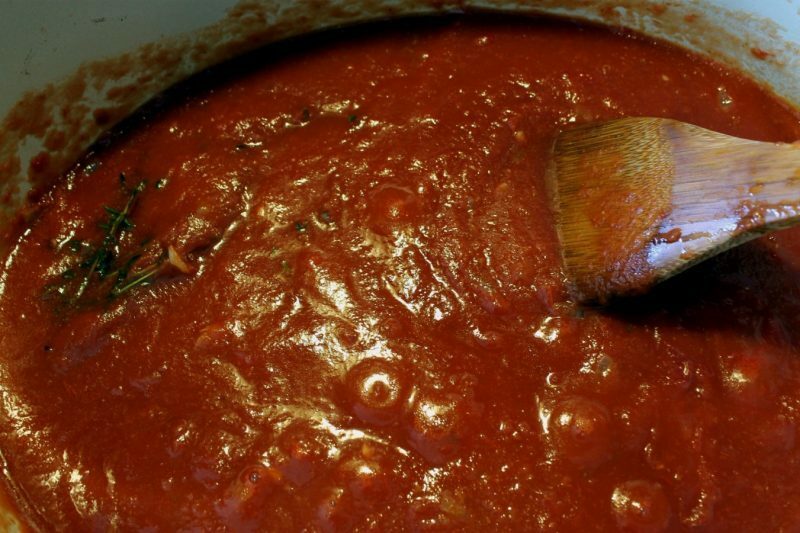 Once the sauce is done simmering, season with salt and pepper to taste. Drain noodles and mix with sauce. Toss in shredded cheese and mix well reserving some for the tops! Spoon into ramekins or small oven-proof bowls. 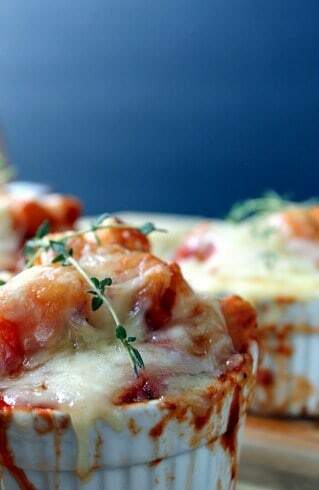 Bake at 375F for 15 minutes or until bubbly and cheese melted. This can be made ahead of time and frozen for up to a month. Just bake in oven for 40 minutes if frozen! What a lovely, homey dish. And so much the better with such fond memories attached to it. 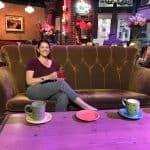 Thanks for reading Heather! I always keep a small casserole of it in my freezer for when I have unexpected guests. The Swiss cheese adds another flavor to it and I hope you like it! Thanks! Oh my god, this looks so comforting! It is raining cats & dogs here today, and this dish just screams “make me on a rainy day!” And I happen to have all of the ingredients already in the house. Hooray! Let me know how you like it! I love it on a rainy day and it’s supposed to rain all week here! Thanks for reading Dee Dee! 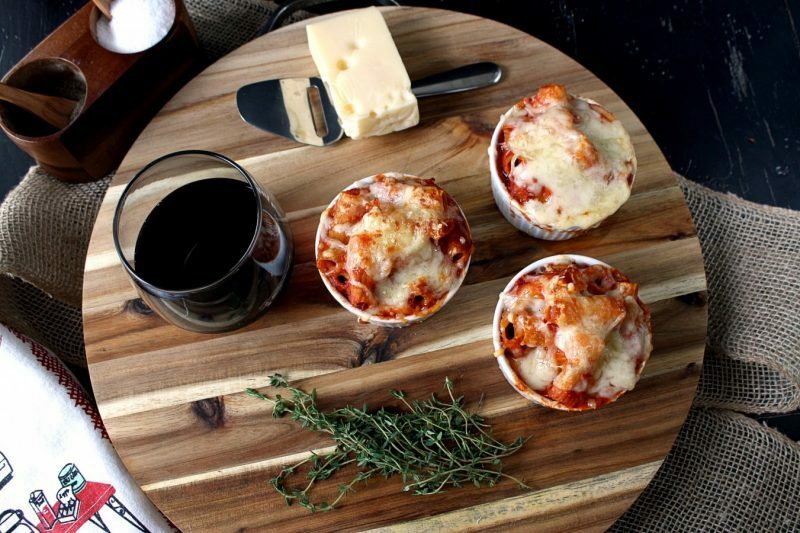 I love the use of Swiss cheese and I love the individual portions! Thanks Pam! The Swiss cheese does add another flavor that I haven’t found anywhere else. I need to ask my grandmother, next time I see her, why she chose Swiss over the other cheeses. Thanks for reading! Going to make for freezer. Love to have things pre-made, so if I am rushed or just don’t feel like cooking. I love that you ate differently as a child. 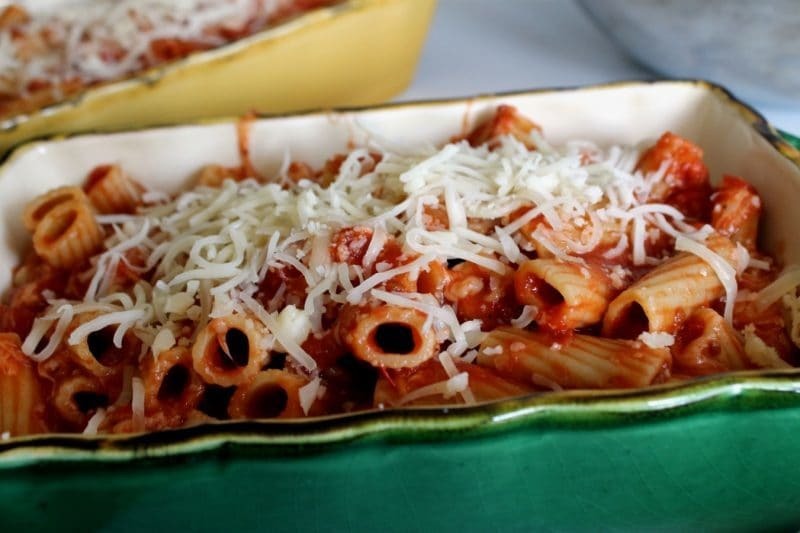 And your Grandma’s rigatoni–well, I have not had swiss on my pasta before, but now I am intrigued to try! Can’t wait for you to try it! The Swiss cheese adds a tangy-like quality to the flavor that is so different from anything “pasta-wise” I have had before! Thanks for sharing!